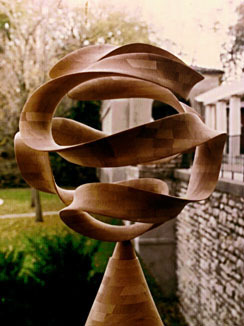 A sampling of Collin's work, photographed by Phillip Geller. 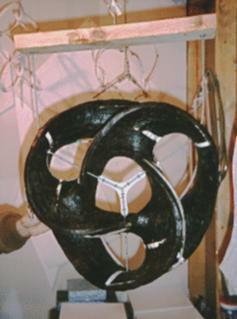 (A) Two-sided surface with "Cruciform Pattern", - (B) Twisted tower with 3rd-order saddles, - (C) "Spyrint". 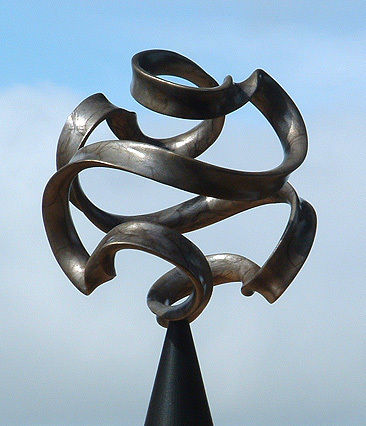 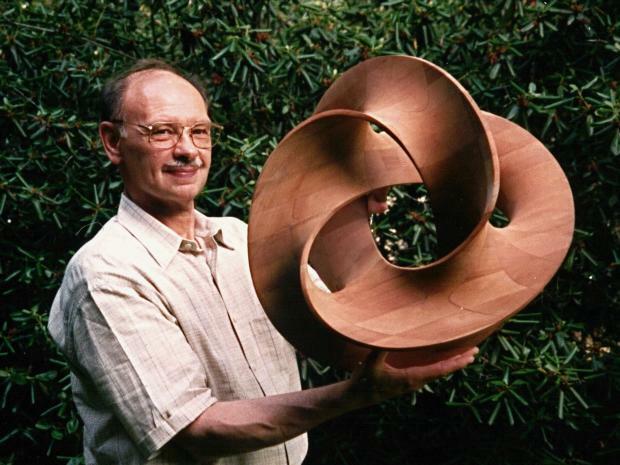 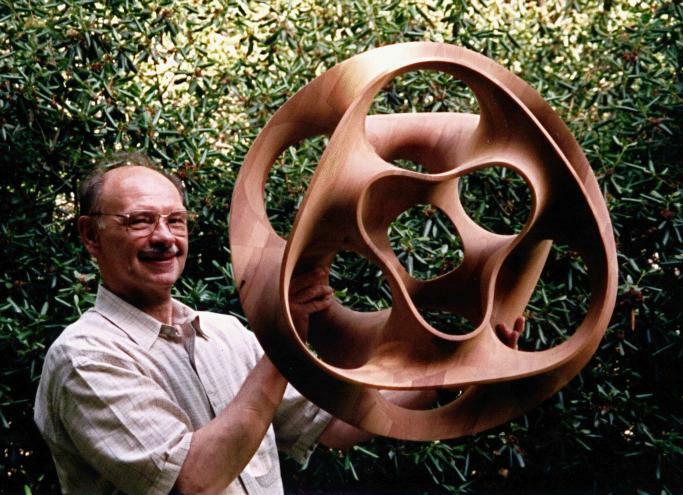 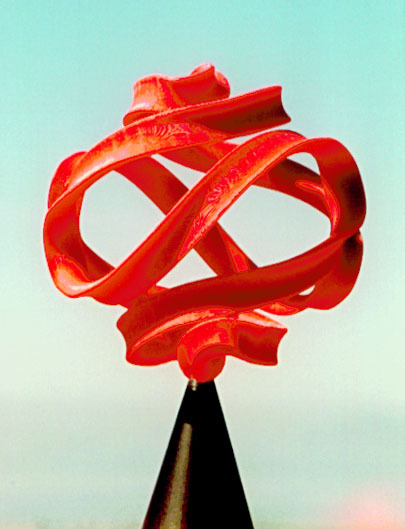 A more recent sculpture is the "Hyperbolic Hexagon"
This shape can also be understood as 6-storey Scherk Minimal Surface, wound into a toroidal loop. 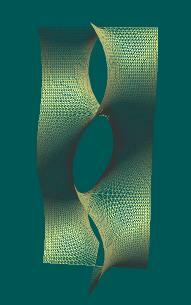 The wireframe above represents the central part of a 3-storey Scherk surface -- to give you an idea what it looks like. 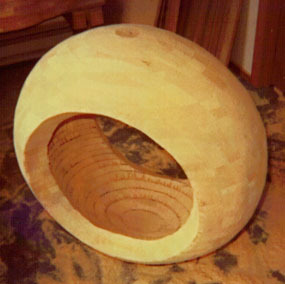 Armature for the "Hyperbolic Heptagon" and mockup for the "Saddle Trefoil"
(about one inch thick) are precut according to these measurements. 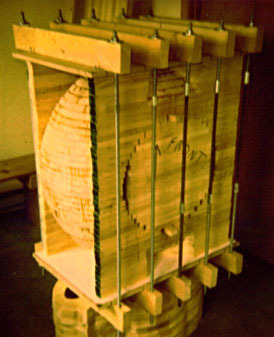 These boards are then stacked and glued together forming a rough first shape. 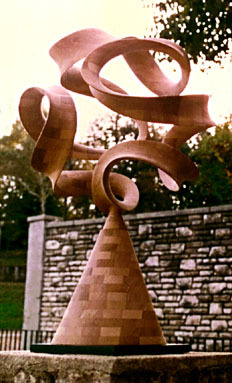 This composite is then refined into the actual sculpture. 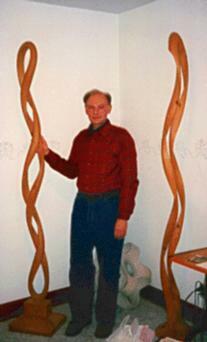 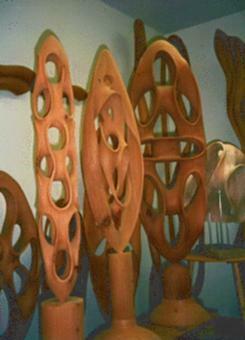 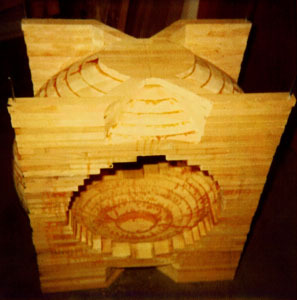 Below are some stages from the creation of one of his 1998 sculptures. 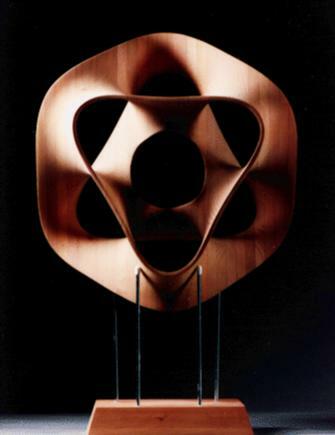 The Creation of "Vox Solis"
The Scherk tower can be given an overall twist before its ends are joined together. 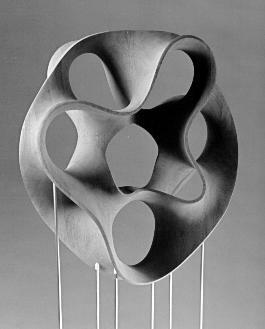 There seems to be a large domain, rich with interesting configurations of such saddle surfaces. 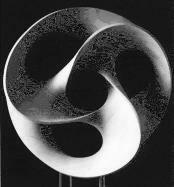 created a special purpose computer program, called the "Sculpture Generator". 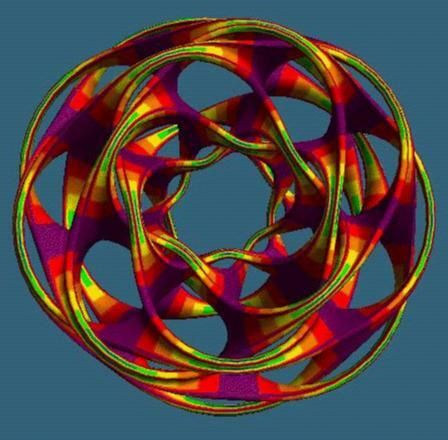 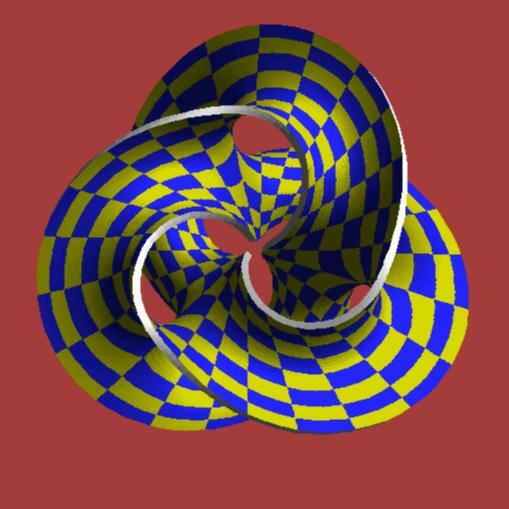 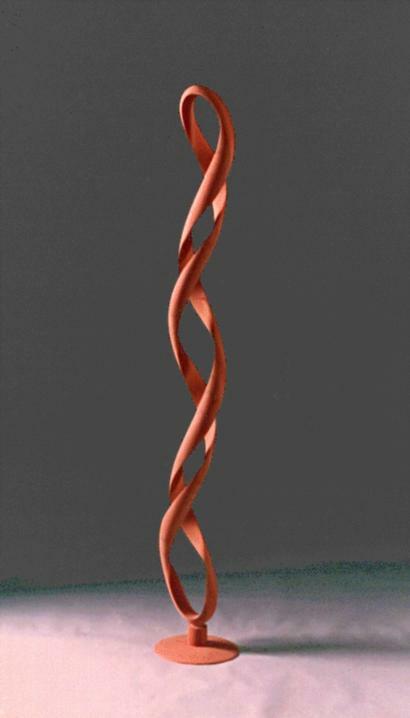 The first shape shown is the result of a search for a minimal Scherk toroid with only 3 stories and with a 270 degree twist. 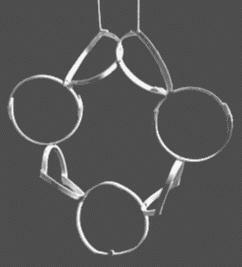 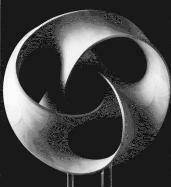 Collins then also created this second version of the trefoil toroid. 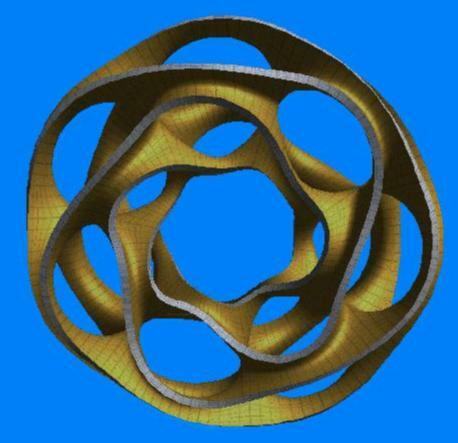 The two solutions are mainly different in the choice of the azimuth parameter. 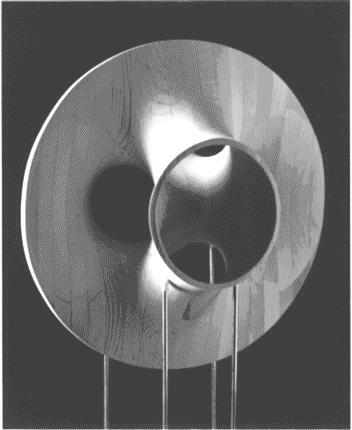 Collins' and Séquin's solution differ mostly in the size of the central hole. 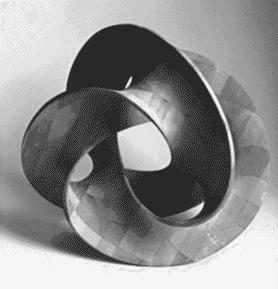 The first joint sculpture built from Carlo Séquin's computer blue prints. 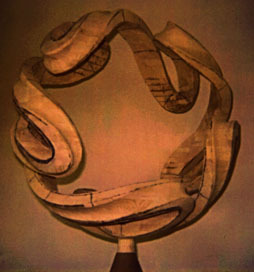 "Pax Mundi", a swept C-section on the surface of a sphere - - - and some variations of this basic concept by Carlo Séquin.